At 0115, 16 July, 1927, an attack on the city of OCOTAL was launched by the forces of A.C. Sandino. The sentry on post in front of the barracks saw a suspicious movement in the street just beyond the officer's quarters and went to investigate. As he approached he was fired upon by four men from the street corner one block west of the officer's quarters. He returned the fire, after which he took his battle station. All the men were dressed and at their assigned stations firing within three minutes from the time the first shot was fired and were receiving fire from all directions, and from well located snipers in addition. The outlaws had evidently infiltrated into the town during the early part of the night and expected to effect a complete surprise. The street on which the Marine Barracks was located was swept by machine gun fire from a position on a hill in prolongation of the street, and it was fire from this gun which wounded Private Garrison. The intersecting street between the barracks and the officers quarters was swept by machine gun fire from a gun located in the Jefe Politico's office, and also by a friendly fire from a machine gun located in the street in front of the barracks of the Guardia Nacional, being fired by Lieut. Bruce in an effort to silence the enemy gun at the office of the Jefe Politico. It was through this barrage, aided by rifles, that the officers had to pass to join their organizations. The initial attack slackened at about 0300, when the bugles sounded their assembly for re-organization. It was at this time that Sandino arrived from Mosonte and evidently changed the plan of attack. Two automatic rifles and some snipers kept up a desultory firing until 0810, when a bearer of a flag of truce approached with a message from Sandino and another from Sanchez. Firing was suspended while the truce bearer approached but all men remained at the ready with orders to allow no shifting of enemy troops or change of enemy dispositions while the notes were being read and replied to. The notes were to the effect that we had put up a brave fight, that we would have guarantee of immunity, and that we were known to be short of water, an error on his part, for we had enough in government "guarro" tanks to last two weeks; therefore if we would throw our arms in the streets we would not be harmed, but if we did not surrender within sixty minutes, he (Sandino) would fire the town and show us an amount of rifle fire that we had not dreamed of before. [ p. 2 ] Captain Hatfield replied that, Marines did not know how to surrender and that water or no water we would stick it out until killed or captured, and that firing would be resumed as soon as the flag bearer had turned the nearest corner. Heavy rifle and machine gun fire continued until about 1015, when two planes arrived, circled the town caught the messages and fired bursts of machine gun fire. One plane, Marine Gunner Wodarczyk, pilot, flew low over field. The pulled up and regained altitude. The other plane, Lt. Boyden, pilot, then chased three mules off field with plane. he saw no marines on the field and landed at the airdrome. Two natives came running from bushes beside field to the plane. They appeared nervous and said that Sandino was in OCOTAL. They indicated that there had been shooting. When questioned, they said the Marines were still in OCOTAL. They then ran to the bushes. The ship took off immediately. Observed panel message laid in street of town, "SANDINO ATTACKING". In the meanwhile the other plane piloted by Marine Gunner Wodarczyk attacked a point at the river one mile S.E. of town. The other plane dived in three times attacking with the front gun. Got off 230 shots. After M.G. Wodarczyk had fired all of his ammunition, 350 rounds, he headed for home. The other plane then attacked five times with rear and front guns, then headed for Managua. At 1315 a formation of five planes made a formation flight to OCOTAL to aid Marines besieged in that place by the bandit Sandino. Each plane carried 17 pound fragmentation bombs and two guns with 800 rounds of ammunition. The planes arrived in OCOTAL at 1440 -- reconnoitered the outskirts of town. On the southeastern edge of town about fifty (50) saddle horses with the men at a house nearby were observed. From the reconnaissance it appeared that the south and southeastern border of the town was occupied by Sandino's troops. The planes circled in column and dove in turn on Sandino's troops, attacking with bombs and gun fire. Several direct hits were observed and the effect was immediate, the men streaming away from the houses and throwing away their arms as they ran. After the planes had bombed these troops the attack was followed by a further attack with fixed and free machine guns completing the rout. The planes repeatedly circled the town and fired on numerous groups of bandits that were fleeing. Captain Hatfield had his headquarters in the center of the town, with the detachment identification panel laid out in the street in front of the house. At 1515 the planes having released all of their bombs the assembly signal was given and the planes returned to Managua. The bombing and machine gun attack caused numerous casualties to Sandino's force. The moral effect was exceedingly great, men throwing down their arms and running in all directions away from the town towards wooded country. The machine gun attack which followed completed their defeat. A las 01.15h, el 16 de julio de 1927, un ataque contra la ciudad de Ocotal fue lanzada por las fuerzas de A. C. Sandino. El centinela en frente de los cuarteles vio un movimiento sospechoso en la calle un poco más allá de los cuartos del oficial y se fue a investigar. Cuando se acercó fue atacado a balazos por cuatro hombres de la esquina de la calle una cuadra al oeste del cuarto del oficial. Regresó el fuego, tras lo cual tomó su estación de batalla. Todos los hombres estaban vestidos y en sus estaciones asignadas disparando dentro de los tres minutos desde el momento en que el primer tiro fue disparado y estaban recibiendo fuego desde todas las direcciones, y de los bien ubicado francotiradores además. Evidentemente los proscritos habían infiltrado en la ciudad durante la primera parte de la noche y se esperaban lograr una sorpresa completa. La calle en la que los cuarteles de la Infantería de Marina se encuentra fue barrida por fuego de ametralladora desde una posición en una colina de prolongación de la calle, y fue el fuego de esta arma que hirió al soldado Garrison. La calle intersectando entre los cuarteles y los cuartos de los oficiales fue barrida por fuego de ametralladora desde la oficina del Jefe Político, y también por fuego amistoso de una ametralladora situada en la calle frente a los cuarteles de la Guardia Nacional, disparado por el Teniente Bruce en un esfuerzo para silenciar la artillería del enemigo en la oficina del Jefe Político. Fue a través de esta barrera, con la ayuda de fusiles, que los oficiales tenían que pasar a juntarse con sus organizaciones. El ataque inicial se había moderado alrededor de las 03.00h, cuando los clarines sonaba su asamblea de re-organización. Fue en ese momento que Sandino llegó de Mosonte y evidentemente cambió el plan de ataque. Dos fusiles automáticos y algunos francotiradores mantenían un improvisado fuego hasta las 08.10h, cuando el portador de una bandera blanca se acercó con un mensaje de Sandino y otro de Sánchez. Fuego se suspendió mientras al portador de tregua se acercó sin embargo todos los hombres se mantuvieron en la lista con ordenes de no permitir el desplazamiento de las tropas enemigas o cambio de disposiciones del enemigo mientras que las notas fueron leídas y respondidas. Las notas eran en el sentido de que había sido un valiente lucha, que tendríamos garantía de la inmunidad, y que fuimos conocidos por ser corto de agua - un error por su parte, ya que tuvimos suficiente en los tanques de "guarro" del gobierno para durar dos semanas; por lo tanto, si tiraríamos nuestras armas en las calles, no estaríamos perjudicados, pero si no nos rendimos dentro de un plazo máximo de sesenta minutos, él (Sandino) se dispararía la ciudad y mostrarnos una cantidad de disparos de fusil que no habíamos soñado antes. [ Pág. 2 ] Capitán Hatfield respondió que los infantes no saben cómo rendirse, y que agua o no agua, aguantaríamos hasta la muerte o ser capturados, y que los disparos reanudarían en cuanto el portador de la bandera hubiera doblado la esquina más cercana. Fuego pesado de rifle y de ametralladora continuó hasta las 10.15h, cuando dos aviones llegaron, sobrevolaron la ciudad, captaron los mensajes y dispararon ráfagas de ametralladora. Un avión, artillero infante Wodarczyk, piloto, voló a baja altura sobre terreno. Y luego tiró la palanca hacia arriba y recuperó altitud. Después el otro avión, el Teniente Boyden, piloto, echó tres mulas fuera del campo con el avión. No vio a ningunos infantes en el campo y aterrizó en el aeródromo. Dos nativos vinieron corriendo desde los arbustos junto al campo hacia el avión. Parecían nerviosos y dijeron que Sandino estaba en Ocotal. Indicaron que había habido tiroteo. Cuando se les preguntó, dijeron que los infantes estaban aún en Ocotal. Después se fueron corriendo a los arbustos. El avión despegó inmediatamente. Se observó el mensaje de panel sentado en la calle de la ciudad, "SANDINO ATACANDO". Mientras tanto, el otro avión piloteado por artillero marina Wodarczyk atacó a un punto en el río una milla sureste de la ciudad. El otro avión se sumergió tres veces atacando con la pistola delantera. Tiró 230 disparos. Después de que M. G. Wodarczyk había disparado todas sus municiones, 350 rondas, se dirigió a casa. El otro avión, atacó cinco veces con pistolas delanteras y traseras, y después se fue para Managua. A las 13.15h una formación de cinco aviones hizo un vuelo en formación hasta Ocotal para ayudar a los infantes en ese lugar asediados por el bandido Sandino. Cada avión llevaba bombas de fragmentación de 17 libras y dos pistolas con 800 rondas de municiones. Los aviones llegaron en Ocotal a las 14.40h -- reconoció las afueras de la ciudad. En el borde sureste de la ciudad se observaron a unos cincuenta (50) caballos de montar con los hombres en una casa cercana. Del reconocimiento parecía que los bordes del sur y sureste de la ciudad estaban ocupados por las tropas de Sandino. Los aviones circularon en columna y sumergieron a su vez a atacar con bombas y disparos a las tropas de Sandino. Varios impactos directos fueron observados y el efecto fue inmediato: los hombres saliendo en tropel de las casas y arrojando sus armas mientras que se corrían. Después de que los aviones habían bombardeado estas tropas el ataque fue seguido por un nuevo ataque con ametralladoras fijas y sueltas para completar la ruta. Los aviones sobrevolaron la ciudad varias veces y dispararon sobre numerosos grupos de bandidos huyéndose. El Capitán Hatfield tenía su sede en el centro de la ciudad, con el panel de identificación del destacamento establecido en la calle en frente de la casa. A las 15.15h los aviones, después de haber lanzado todas sus bombas, se dio la señal de montaje y los aviones regresaron a Managua. El bombardeo y ataque de ametralladora causaron numerosas víctimas en las fuerzas de Sandino. El efecto moral era muy grande: los hombres arrojando sus armas y corriendo por todas las direcciones de la ciudad hacia los bosques. El ataque de ametralladora que siguió completó su derrota. • First of several PC-Docs & other reports on first military engagement between Marines & EDSN. • EDSN attack on Marine-Guardia garrison at Ocotal made headlines around the world, as did the slaughter of upwards of 300 rebels in aviators' counterattacks. • Military historians consider this the first instance in history in which ground forces (led by Capt. Hatfield) directed an aerial assault against opposing ground forces. • Events leading up to the Sandinista attack & the battle itself receive extensive treatment in the literature (e.g., Neill Macaulay, The Sandino Affair, chap. 4). • Ocotal events also comprise an important element in Sandinista historical memory, e.g., IES testimonies. • Reaction of world press to these events discussed in my article on the air war (International History Review, Sept. 2007) and on the Air-Toons page. • lllustration at right: "The Black Hills of Nicaragua," St. Louis Post-Dispatch, 25 July 1927. Interior plaque: "Personalidades de Ocotal que transcienden al nuevo milenio"
• El primero de varios PC-Docs & otros informes del primer enfrentamiento militar entre los Marinos y EDSN. • El ataque por EDSN contra la guarnición de los Marinos-Guardia en El Ocotal fue noticia en todo el mundo, al igual que el sacrificio de más de 300 rebeldes en los contragolpes de los aviadores. • Historiadores militares consideran que este es el primer caso en la historia en que las fuerzas de tierra (dirigidos por el Capitán Hatfield) dirigieron un ataque aéreo contra las fuerzas opuestas de tierra. • Los hechos que condujeron el ataque Sandinista y la batalla misma reciben un amplio tratamiento en la literatura (p. ej., Neill Macaulay, El Sandino Affair, cap. 4). • los eventos de Ocotal son también un elemento importante de memoria histórica Sandinista, p. ej., testimonios IES. • Reacción de prensa mundial de estos eventos en mi artículo sobre la guerra aérea (International History Review, Sept. 2007) y en la pagina Air-Toons page. 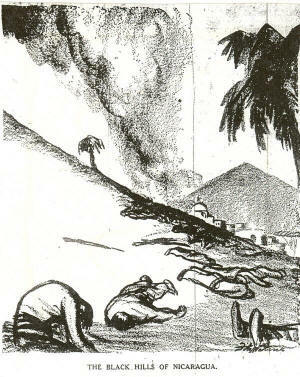 • ilustración arriba: "Los Montes Negros de Nicaragua", St. Louis Post-Dispatch , 25 de julio 1927. • En la actualidad los ex-cuarteles de los infantes de Marina bordeando la plaza de la ciudad de Ocotal es un museo, "La Casa de la Cultura Augusto C. Sandino" y está mantenido por la Alcaldía de Ocotal; aparecen unas fotos arriba. En particular, la placa que describe el ataque es históricamente inexacto, la Infantería de Marina norteamericana no se iniciaron la ocupación de Ocotal hasta los principios de junio 1927, no 1926, como se indica en la placa (4ª imagen arriba). Fotos de Michael J. Schroeder, Febrero de 2012; haga clic en las miniaturas para ver las fotos.